Ylang Ylang is truly the oil of the heart (one of the best oils for our heart chakra) because it helps us to connect to our own heart, process things from the heart and heal emotional traumas. It’s the oil of the inner child and that means it helps connect us to a source of joy that comes from within. Think of when you were a child how in the moment you were, always wanting to play, releasing your emotions easily and trusting the process of life because that is what you knew how to do. You didn’t know otherwise until you gained some experiences, some not so nice. Ylang Ylang is such a powerful remedy for the heart by helping us release negative emotions such as anger, possessiveness and low self-esteem as well as nourishes positive emotions of confidence, self-love and spiritual awareness. In a world that rewards mind over heart, Ylang Ylang reminds us that the heart is the best medium through which to receive and process information because it is so intuitive. This is another great oil to help us tap into our right-brain (intuition) a little more for those of us that are too logical and take life too seriously. 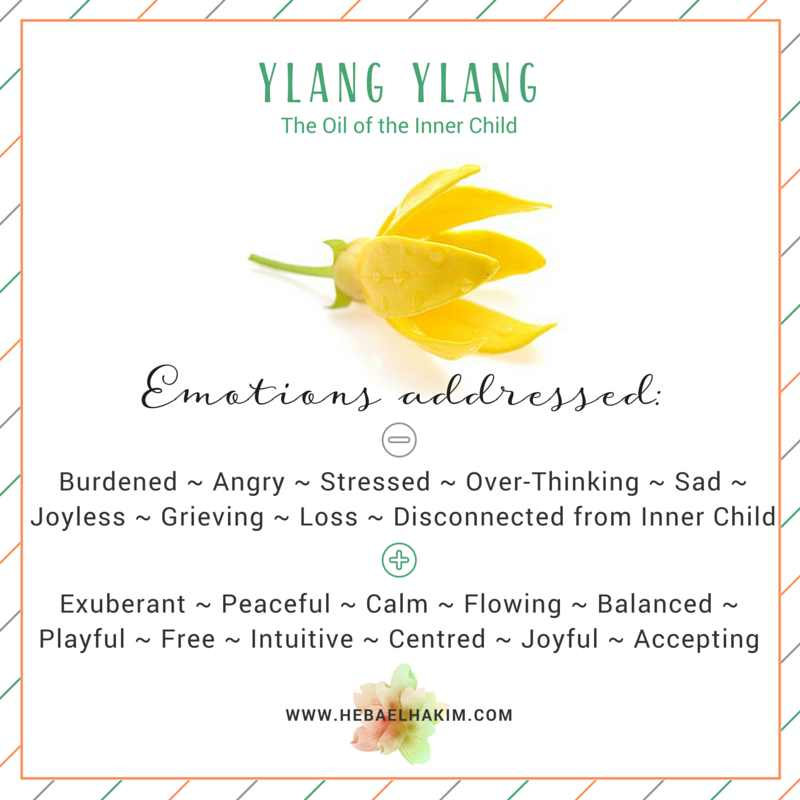 Ylang Ylang reconnects us with our child self, so pure and simple. It encourages play and brings you back to your childlike nature and innocence. Ylang Ylang is an emotional trauma healer. It allows emotional healing to flow naturally, nourishing the heart in the process. It reminds us that joy can be felt and experienced more fully when we allow the heart its full spectrum of emotions that can be felt. Feelings that have been buried inside are easily surfaced through Ylang Ylang’s assistance. Ylang Ylang blends well with Bergamot, Frankincense, Geranium, Grapefruit, Lemon, Marjoram, Sandalwood, Vetiver. Depending on your uses for this oil, substitutes may include:Bergamot, Geranium, Lavender, Vetiver. Always test for skin sensitivity prior to widespread use and use on the feet when possible. Excessive use of any oil can lead to skin sensitisation. Keep out of eyes, ears, or nose. Not all oils are created equal, so test brands carefully, and never use an oil in a way not recommended by its maker.